Reactis® V2012 is now ready for download. It offers faster import for large models, enhanced support for buses, initial support for Embedded MATLAB® and many other updates and new features. V2012 includes optimizations that speed up model import for large models, especially those that reference large amounts of data in the workspace or are configured with very large search paths. The improvements yield over a factor 10 speed-up for many models. For example, import time for one large automotive model went from 30 minutes to 2 minutes. Support for buses was substantially enhanced in V2012. In the main panel, signal lines are now drawn so you can easily see whether the signal is a scalar, vector, virtual bus, or non-virtual bus. A new graphical editor for constraints of top-level bus inputs greatly simplifies working with models that have top-level bus inputs. In Reactis Simulator there are several new ways to view bus data. You now see bus element names when hovering in the main panel. You can also now open a watched variable or scope on an individual element of a bus. When exporting/importing a test suite to/from CSV, you can now store individual bus (or vector) elements in separate columns. The import GUI also now supports mapping individual elements. The runtests utility for executing Reactis-generated tests in Simulink also now supports top-level bus inports. V2012 includes initial support for Embedded MATLAB, including the MATLAB Function and Truth Table blocks in Simulink and MATLAB and Truth Table functions (with MATLAB language option) in Stateflow. Initially only a subset of the language is supported and will be extended over time. If there are missing features you would like to use, please let us know. Initial support for MATLAB R2012a models. All Reactis settings that affect the behavior of models can now be modified on a model-by-model basis. Models with multiple S-Functions configured for white-box analysis with the Reactis for C Plugin now initialize faster. A library used by an S-Function can now be pre-compiled by the Reactis for C Plugin and the pre-compiled library can be used in Reactis for C without the source code. New options have been added to the test suite import and export facility. 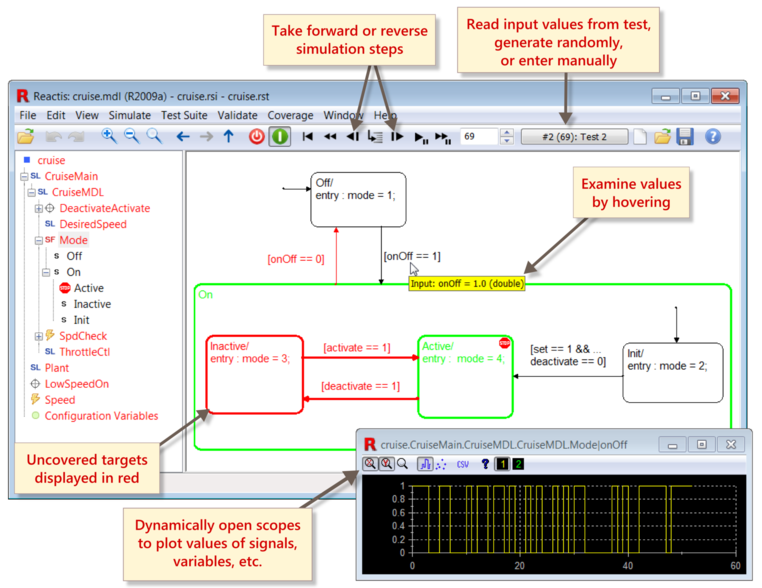 Hierarchical browsing of models, including Simulink, Stateflow, C Code (included as S-Functions or Stateflow custom C code), and Embedded MATLAB code. Text search of the model (including C code and Embedded MATLAB code). Look for the release of the Reactis Model Inspector during Q3 2012. ISO 26262 is a functional safety standard published in November 2011. Reactis offers a number of capabilities to help you comply with the new standard. Reactis offers a number of model navigation capabilities that facilitate design walk-throughs and inspections at both the architectural and unit levels. Reactis Validator lets you formalize safety requirements as assertions and then check for violations using semi-formal verification. These checks can be performed on both architectural design models and unit design models. Reactis Tester can automatically generate test suites that aim to maximize statement, branch, and modified condition/decision (MC/DC) coverage. Finally, Reactis offers extensive support for back-to-back testing (in which the behavior of code is compared to the behavior of a model). We are pleased to announce the availability of a white paper describing how Reactis can help with ISO 26262. Reactis is best known for its automatic test suite generation, but the model debug tools available in Reactis Simulator can also be a valuable aid to ensure correct model behavior. The toolbar shown below offers easy integrated control of the execution of Simulink, Stateflow, and C code. The buttons offer fine-grained control of the stepping. You can execute a block at a time, a simulation step at a time, or multiple steps at a time. Reverse execution lets you go back in a simulation run either a single step or multiple steps. When control resides in C code you can back up a C statement at a time. Stepping backwards can be quite useful for diagnosing an error. If Reactis Tester finds an error, a test can be loaded an run in Simulator right up to the error. You can then step backwards to understand the events that preceded the bug. While a model executes, Reactis gives you visual feedback to indicate which parts of your model and code have executed and which have not (unexercised elements are drawn in red). A number of features are also available for tracking data items. Hover with the mouse over any variable or signal to see its current value. Data items can also be tracked using the watched variable panel or scopes.